This is the moment the consumer chooses you. And whether or not the purchase happens on mobile, these moments are increasingly influenced by mobile. In part four of this five-part series on shopping micro-moments, we explore how retailers can optimize their mobile experience to close the deal. In I-want-to-buy-it moments, shoppers have already researched, compared, and prepared, and they're finally ready to put dollars behind their decision. The question is: How will they buy? What does this mean for retailers? Whether shoppers turn to mobile to buy or to simply get that final piece of information before heading to the cashier, it's crucial to show up with a fast, frictionless mobile experience. If your site is clunky or slow, a shopper could abandon it—or even worse, head to a competitor. 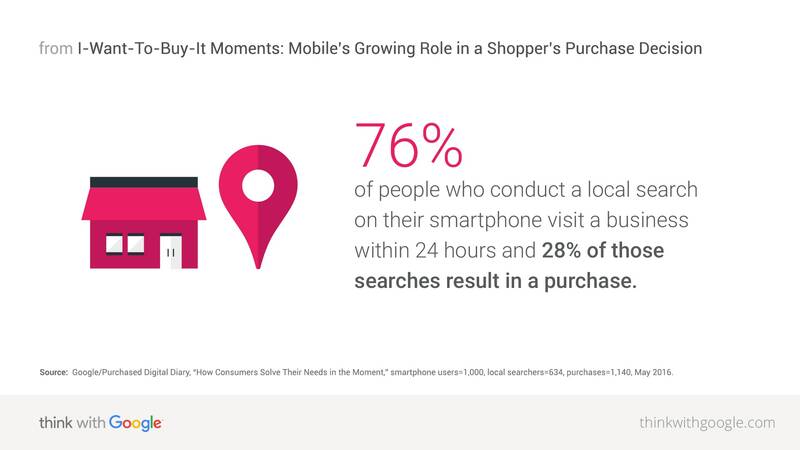 To see just how this plays out, let's start by looking at one shopper's micro-moments. Source: Google/Purchased Digital Diary, "How Consumers Solve Their Needs in the Moment," smartphone users=1,000, local searchers=634, purchases=1,140, May 2016. We all know that online interactions play a role in influencing the ultimate purchase decision. But how much so? New clickstream data from Luth Research's opt-in panel3 (which shows the online pages a user visited) and Mindswarms mobile video surveys4 provide just that type of insight. 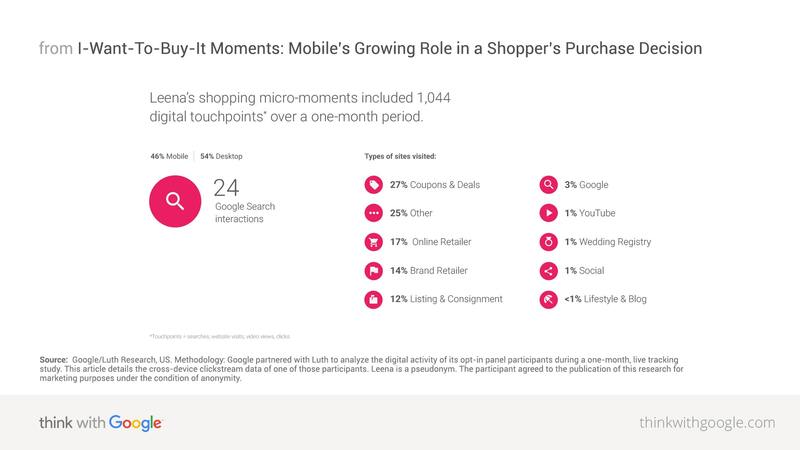 By analyzing one shopper's micro-moments (in the form of searches, clicks, and website visits) over the course of one month, we can start to see exactly how and how much digital played a role in influencing her purchase decisions. Meet Leena, a 32-year-old married female from Washington state. Leena's a super shopper who regularly looks for deals and coupons online. Over a month period, Leena has over 1,000 retail interactions across a variety of sites and constantly switches between mobile and desktop as she shops. 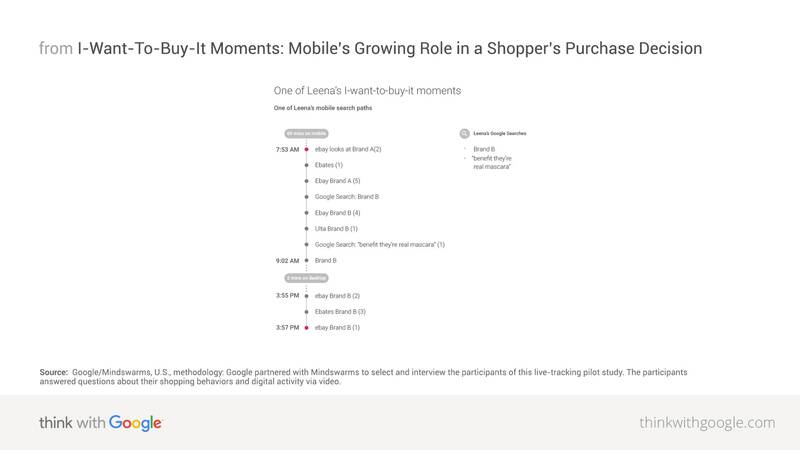 Here's a high-level look at the digital touchpoints (searches, visits, and clicks) that shaped Leena's shopping micro-moments that month. Source: Google/Luth Research, US. Methodology: Google partnered with Luth to analyze the digital activity of its opt-in panel participants during a one-month, live tracking study. This article details the cross-device clickstream data of one of those participants. Leena is a pseudonym. The participant agreed to the publication of this research for marketing purposes under the condition of anonymity. Now, let's look at Leena's search query path for a specific I-want-to-buy-it moment. Leena ran out of mascara and was interested in switching from her traditional drugstore brand mascara to something that would last longer and provide a better look. While shopping on her phone, Leena narrowed her choices down to two mascara brands, read a number of product reviews, and eventually bought a specific mascara from Brand B due to the reviews and price point. Source: Google/Mindswarms, U.S., methodology: Google partnered with Mindswarms to select and interview the participants of this live-tracking pilot study. The participants answered questions about their shopping behaviors and digital activity via video. To win these moments, the best retailers create a seamless checkout experience both online and in-store. Here are some actions you can take to ensure shoppers' will want to buy from you. Resurface promotions, deals, and coupons at checkout. As you've seen in Leena's story, buyer decision-making online is sometimes all about price, deals, and coupons. If shoppers have to hunt for promotions, deals, or coupon codes, they may abandon your mobile site or app to search for them, leaving no clear path back to return to their shopping experience. Avoid losing shoppers who have yet to make a purchase by providing promotions, deals, and coupons immediately at checkout. Provide multiple checkout and fulfillment options. When ready to buy, people want convenience and simplicity. Consider this: Twenty-three percent of people abandon retailer sites because they had to create a new user account at checkout.8 So, allow first-time buyers to purchase before suggesting account creation. As for payment and pick-up, people want options: Sixty-nine percent of people say that it is important that a retailer offers multiple ways to buy a product, such as buying online or picking up in-store.9 Enable people to buy quickly via Android Pay, PayPal, and other platforms where their information is stored. Argos has been one of the U.K.'s best-known "high street" retailers for 40 years. For many years, customers would walk in, order from a catalog, and wait for an employee to bring the item out from the storeroom. But when Argos put its inventory online, the company realized everything had changed: Forty-six percent of Argos' customers start online, while 90% of its customers still end up in-store to buy. In a business that's all about immediacy and driving customers into the local store, Argos needed to find new ways to use mobile and online to connect with its customers. To make the purchase process as easy and seamless as possible, Argos started running local inventory ads online to surface products that were available in the stores closest to where that customer was searching. The customer could then reserve the product online, and on her way home from work, drop into the nearest Argos store to collect the order. Fast Track—a speedy, in-store pickup option that Argos launched in 2014—allows customers to collect their products in-store in fewer than 60 seconds. Argos' new approach to mobile is working: Nearly half of Argos' total sales now come from online shoppers. Another example of a retailer that knows about frictionless buying: Fancy. The company sells unique crowd-curated goods to buyers who want to have the next cool thing, from dog trench coats to plasma-ignited lighters. Its customers buy on impulse, and impulses can be lost quickly when the buyer is confronted with a long payment flow. To lower cart abandonment rates, Fancy implemented Android Pay, a simple and secure way for Android users to check out on mobile by entering their payment and shipping information with a single click. Not only did Android Pay simplify the payment flow for millions of users on its site, it actually doubled Fancy's conversion rate. Now, 20% of Fancy's Android users check out with Android Pay at no additional cost to Fancy. There's a lot more to learn. Check out this more detailed feature on Fancy's approach to I-want-to-buy-it moments, including a video complete with interviews from the people driving this thinking for the brand. The bottom line: Even when shoppers don't buy on mobile, mobile has a big role to play in making the sale. And when the sale does happen on mobile, the retailers that close the deal have a fast, frictionless experience. In part five of our series, we'll look at the three simple steps to winning shopping micro-moments in this new customer decision journey. 1 Deloitte, "Navigating the Digital Divide," U.S., 2014. 2 Google/Purchased Digital Diary, "How Consumers Solve Their Needs in the Moment," smartphone users=1,000, local searchers=634, purchases=1,140, May 2016. 3 Google/Luth Research, U.S., methodology: Google partnered with Luth to analyze the digital activity of its opt-in panel participants during a one-month, live-tracking study. This article details the cross-device clickstream data of one of those participants. Leena is a pseudonym. The participant agreed to the publication of this research for marketing purposes under the condition of anonymity. 4 Google/Mindswarms, U.S., methodology: Google partnered with Mindswarms to select and interview the participants of this live-tracking pilot study. The participants answered questions about their shopping behaviors and digital activity via video. 5 Google Data, aggregated, anonymized data from Google Analytics for U.S. retailers, Apr. 2016. 6 Google/Ipsos, Consumers in the Micro-Moment, Wave 3, U.S., online smartphone users 18+, n=1,291, Aug. 2015. 7 Radware, "State of the Union: Page Speed & Performance," Spring 2015. 8 eMarketer, Visual Website Optimizer (VWO), "eCommerce Survey 2014," Oct. 2014. 9 Google Consumer Survey, U.S., online population aged 18+, n=1,513, Jun. 2016.